It doesn’t matter whether you are a Hair Stylist, Nail Technician, Massage Therapist, or Makeup Artist. If you're not properly marketing yourself, you are losing money every day…even the days you work! 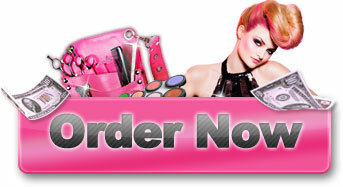 If you're a Cosmetologist, and you are not making as much money as you want, then you've come to the right place. Amanda, on the other hand, graduated from cosmetology school less than 2 years ago, works 3 or 4 days a week, and like Erika, has regular clientele. The difference is she makes more than double the amount of money Erika makes and her paycheck is increasing week after week. How is it possible that Erika’s barely getting by? She works more days, she's more experienced, and she's got regular clients, too! Erika is just like 90% of the Cosmetologists around you; doing her job, not building her business. So while Erika is working harder, Amanda works smarter. Amanda started marketing her business even before she got out of school. By the time she got her license, she already had a two week waiting list of clients. She's able to work fewer days because her chair is full all day long. The phone rings constantly with new clients asking for her by name. And she's booked solid for a month at a time. Today you will learn everything you need to double, triple and even quadruple your monthly income and build your personal brand as a leading Cosmetologist. You have the talent and skills. Why should there be a cap on the amount of money you are making. You control your future. “I recently moved from Florida to Georgia and needed to rebuild my clientele quickly. Using a few tips I learned from “Top 10 Modern Marketing Secrets”, I am doing as much business as I did back home but am making twice the money”. They don't teach this stuff in school. And they didn't even mention it back when Erika was in school. The majority of people in your field get their Cosmetology license, have business cards printed and think they're good to go. Maybe they think new clients will magically appear as regulars move away or stop coming. They depend on the shop owner to advertise for them, or bank on the fact that the franchise is so well known they'll get lots of walk-in trade. Walk-in trade is good for extra cash, but you should never count on them as the bread and butter of your income. Why? Because there's no loyalty in walk-in clients. You don't have the opportunity to build a relationship with them. No, you should never rely on walk in trade. In fact, your goal should be to increase your business to the point you don't have an empty slot in which to put a walk-in. Let them go to the cosmetologist who's just doing a job, because you're too busy building a business. At the other end of the spectrum are the ones who spend gobs of money, month after month, advertising their business in the wrong places, wondering why business is not picking up more. They're the ones who have to stay till 8 or 9 o'clock at night, trying to make enough to cover their bills. All Payments Processed Securely Through Clickbank. "I don't know the first thing about marketing"
"What the heck IS marketing, anyway?" "Doesn't the shop owner take care of that?" "I don't want to sell anything"
"I've already got business cards, that's advertising, right?" "How hard is this marketing stuff?" "How much time will I have to put in it?" "Isn't it expensive to advertise?" Marketing your business just means promoting it. Advertising the right way, in the right places. It's really so simple, I couldn't understand why more cosmetologists were not doing it. So I did some research and found that no one was teaching them how. 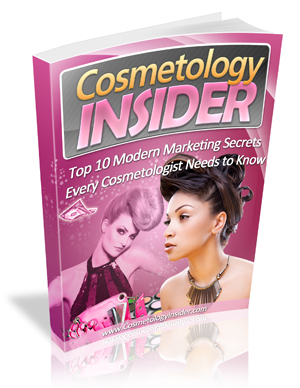 Everything you need to know to explode your customer base and increase your profits can be found in "Top 10 Modern Marketing Secrets Every Cosmetologist Needs to Know". The easy to use techniques are explained in step by step detail. In today's competitive marketplace, it's not enough to just have business cards to hand out. You have to take an active role in your own business promoting. In order to enjoy the benefits of a large client base, you can't depend on someone else to do your marketing for you. Even if you're part of a well-known establishment, any advertising done is done for their business, not yours. With "Top 10 Modern Marketing Secrets Every Cosmetologist Needs to Know" you'll have a blueprint you can follow to make promoting your business as easy as possible, even if you think you can't sell water to a thirsty man, or don't want to sell anything at all. Believe it or not, you're already selling something every day. Sometimes you sell your child on the idea of eating his vegetables. You sell your customer on a different hair style or color. You sell your husband, wife or significant other on taking a trip next weekend, or even something as simple as watching a certain TV show. The reason those examples may not seem like 'selling' is because you don't have to think about the 'strategies' involved. And that's how easy it will become when you learn how to successfully promote your business. It doesn't have to be hard, or expensive or time consuming. You just need a plan laid out for you to follow. The number one thing your success hinges on. Get this wrong and you lose the opportunity to make more money. The one tool you desperately need to expand your business. You don't get it at the beauty supply house and it isn't found on a work station. The secret to getting your clients to market your business for you. It goes far beyond word of mouth and your business will grow at astonishing speed. Five simple ways to ensure client loyalty. They're incredibly simple and amazingly effective, yet most hair stylists are not taking advantage of them. Discover a proven marketing technique to advertise your business...that doesn't cost a dime. This one technique has the power to double your business within days. How to get your local paper to advertise your business...for free! Find out why they're desperate to help you. The most important place your business name NEEDS to be seen...and it's not the yellow pages! Every day you're not actively promoting your business, you're losing future money. Why wait? Get your copy of “Top 10 Modern Marketing Secrets Every Cosmetologist Needs to Know” today and you can be putting to use valuable business building techniques as early as tomorrow. Click the pink button below and you'll gain instant access to all the ways of building your business you can start applying immediately. You have no more excuses because for a LIMITED time, we are offering our expert marketing program for only $9.95. That's a 75% savings! It's less than you'd pay for one small ad in your local newspaper and the information contained inside will help you spread the word about your business far beyond the reach of a local paper. Crafting the Art of Referrals: Getting and Keeping New Customers through Word of Mouth Advertising. It's not enough to tell your clients to tell their friends. This short, meaty report shows you ways that will have your customers referring every person they meet, and they'll love doing it! You're Not "Just a Cosmetologist" -- Revising your elevator speech --- Networking is all about selling yourself in the first 30 seconds of meeting someone. How do you describe what you do? Do you simply "cut hair?" Do you just “apply makeup or paint nails?” Working on your elevator speech is as important as polishing your resume. Never heard of an 'elevator speech'? Don't have one yet? You'll learn what it is, how it's used and how to create an interesting, informative 30 second synopsis of you and your business. Six Best Ways to Use Forums and Blogs to Drive Traffic to Your Website or Social Network Page- How to create, manage, and keep up an interesting forum/blog "persona" and how to get people to Digg, Deli.cious, and spread your message to their networks and their networks' networks, and their networks' networks' networks. Sound confusing? This report makes it all perfectly clear! Claim your copy of “Top 10 Modern Marketing Secrets Every Cosmetologist Needs to Know” PLUS your free reports by clicking on the pink button. You'll be taken to a secure payment page to enter your information. The downloadable ebook and the free reports will be sent to you instantly. P.S. Time is running out on this Limited Time Introductory Offer. “Top 10 Modern Marketing Secrets Every Cosmetologist Needs to Know” will be available at the price of only $9.95 for the next 48 hours. What are you waiting for? So unless you're already making all the money you want, grab your copy today!